Anna Demeanour: Hello! 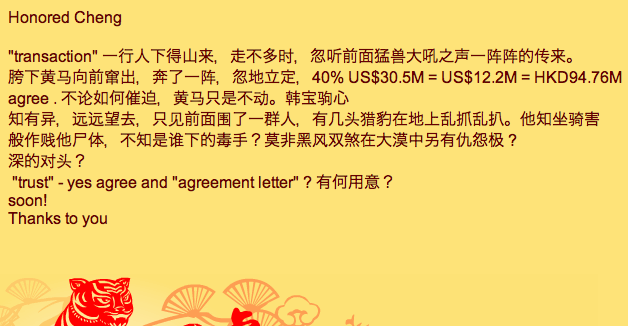 I was excited to hear from the head of a major Chinese bank with a great deal for me! And it was a chance to practice Chinese! I don't speak Chinese, but I'm pretty sure he doesn't either. Scammer #1: Vincent Cheng, impersonating the Chairman of the Hong Kong and Shanghai Banking Corporation (HSBC). This Vincent's origin is probably some latitudes west of Hong Kong. Or east, depending which direction you go. I am Mr. Vincent Cheng Hoi Chuen, GBS, JP Chairman of the Hong Kong and Shanghai Banking Corporation Limited. ; I have a sensitive, confidential brief from Hong Kong and I am asking for your partnership in re- profiling funds. All confirmable documents to back up this fund shall be made available to you, as soon as I receive your reply, I shall let you know what is required of you. 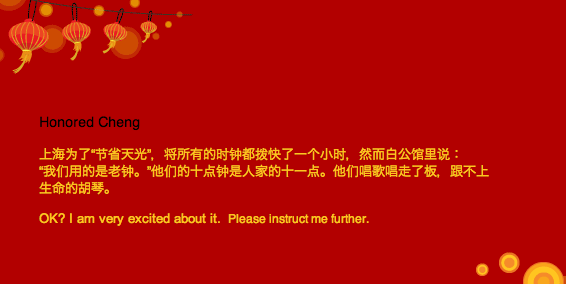 Yahoo even provided Chinese New Year stationery. (http://www.hsbc.com/1/2/about/board-of-directors) in order for you to know more about me , I want to be sure that you are ready, to execute this transaction with me, What I expect from you is trust and commitment, I want this large sum of money transferred with your assistance and you should have nothing to worry about regarding legality AT ALL, because what may affects you? Shall also without fail gets back at me too, considering the paper work we are about to sign together but, I will appreciate you to follow my directives amicably as everything shall be done in accordance passing through all international banking laws, and as a banker I know that if we follow up this transaction diligently it would be completed within 9 working days. 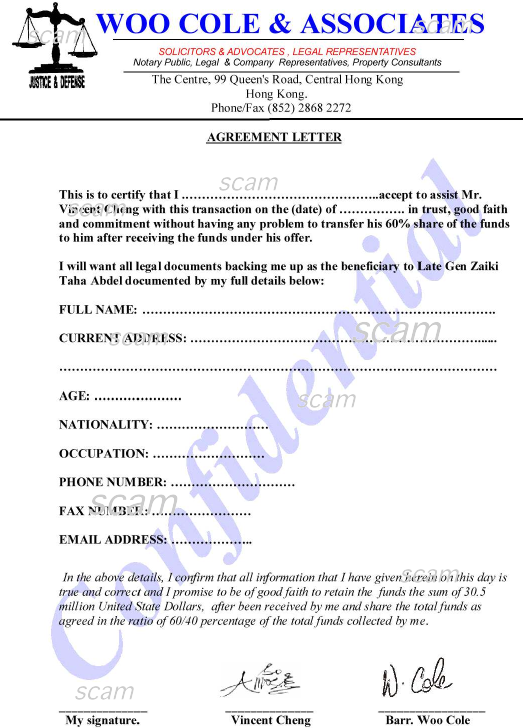 I have attached to this mail, an agreement letter which you are to fill and sign, then scan and send it as an attachment via E-mail to me, before the Attorney can go ahead with the preparation of the application for funds release and some other documents which you shall also sign, before he can officially tendered the application on our behalf, so that it will be look into and before the funds can be endorse for transfer. I await your prompt reply on this. It's a Dead Bank Customer 'format'. [Format is what the scammers call the themes they use to scam people. "Woo Cole" is the closer, the scammer who comes in to close the 'deal'. The scammers will share the loot (what they bleed from their victim) according to a 'sharing percentage'. The scammers may not be on the same continent or know each other personally. [Can I waste more of his time? I can try! I expected an instruction to contact the "Attorney", "Woo Cole", directly. Instead "Cheng" asks me to send the form back to him. Maybe this is his way of deciding whether his prospects are worth sending on to the "Attorney". I'm not filling out his silly form yet. He has to work for it.